So, yes, I re-read this truly excellent book for the third time and I must say it only gets better with each reading. I first read it about 20 years ago, just for curiosity, and didn’t get all that much out of it (yawn). I read the C.K. Scott Montcrief translation that time. Then about 5 years ago I reread the same physical book when a friend and I joined forces to read the whole novel of 7 volumes of In Search of Lost Time in 7 months – that reading was much more enjoyable. This most recent time a reading group selected it for their June, 2013 discussion. I splurged and got the Lydia Davis translation this time and read at the rate of about 30-40 pages a day, sometimes twice a day for 15 or 20 pages. That pace felt perfect for comprehension and for speed – I wasn’t rushed, but I felt like I was chugging along on it, engaged and appreciative. A related matter is that written French has changed very little in the last 100 years, whereas written English has changed an enormous amount – hence the need for a translation which uses the English closer to what we 21st century readers use. Oh well – I did so enjoy the Moncrief version, but I think I actually comprehended more from the Davis. Chapter 1, “Combray,” introduces the themes which will be pursued throughout this volume, as well as the entire 7-volume novel, sensory and aesthetic perception, memory, love, social class, the arts, love of various kinds and all of the above intertwined. There’s a huge element of satire which is very well done. ‘Combray,’ focuses on a exquisitely detailed description of the young narrator’s feelings about his mother and the sensory experiences of separation and the old narrator’s later memories of that. That’s what the madeleine segment highlights – how “involuntary memory” can be triggered by sensory input. The reverse is also true and because of sensory experience an intense and lasting memory may be created. In Chapter 2, ‘Swann in Love’ there is an example of this “involuntary memory” when Swann meets Odette and remembers the face of a woman in a classic painting. Then he hears a piece of a sonata which becomes indelibly imprinted with Odette’s presence. These memory-based experiences prompt him to fall in love and stay in love, obsessive love, with someone who is completely wrong for him. This chapter holds the central “plot” of the Swann’s Way and develops the themes inaugurated in “Combray.” And more characters – the hypocritical Verdurins, Forcheville, Charlus. This is Swann’s story as told by Marcel but it occurred prior to his birth – it does concern him, however, because of Gilberte – Swann’s young daughter. The larger plot, such as it is, develops over the whole 7 volumes – there are several plots really, as Marcel grows up and gets on with life – mostly his love life and the arts as well as his society connections. Swann’s Way kind of sets the whole thing up. But it has to be mentioned that the writing is so careful – so meticulous – Proust tried to get every nuance of Marcel’s desire for his mother, his collapse in the face of denial. And he did the same thing with Swann and his obsession with Odette. 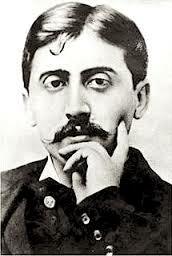 Proust captured very subtle nuances and shifts in emotion. Sometimes it feels like he is painting with words. Still for all of that, there were several times it about put me to sleep. (heh) – Seriously, I got kind of burned out about 3/4s through – I don’t know what it was, but Swann’s little Odette issues just played out for too long and then in Chapter 3 poor young Marcel was mirroring them. I think I have now (after 3 readings!) 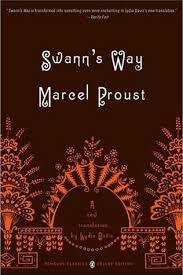 had my fill of Swann’s Way. It’s claimed that Ulysses is the best 20th century novel originally written in English, but if the category were expanded to world lit – English, French, Japanese, Russian, Hebrew, whatever – I think the best might be In Search of Lost Time (or in the top 10 anyway) because it’s both challenging and meaningful on a very high level. Lots of cognitive and affective skills come into play reading it. The challenge and meaning comes from the way Proust deals with his themes – he shows us how the senses, particularly the aesthetic senses but simple ones as well – taste for instance, affect us in the present time and because of the sensual impact memory is created. He doesn’t just tell us this – he shows his characters living it – the way Marcel responds to the madeleine, the way Swann responds to the sonata.